Mensuration is the skill of measuring the length of lines, areas of surfaces, and volumes of solids from simple data of lines and angles. Mensuration in its literal meaning is to measure. It is generally used where geometrical figures are concerned, where one has to determine various physical quantities such as perimeter, area, volume or length. Measuring these quantities is called Mensuration. Perimeter: A perimeter is a path that surrounds an area. The term may be used either for the path or its length – it can be thought of as the length of the outline of a shape. The perimeter of a circular area is called its circumference. It is measured in cm, m, etc. Area: Area is a quantity that expresses the extent of a two-dimensional surface or shape in the plane. Area can be understood as the amount of material with a given thickness that would be necessary to fashion a model of the shape, or the amount of paint necessary to cover the surface with a single coat. This is measured in square unit like cm², m², etc. Volume: Volume is the amount of space enclosed by a shape or object, how much 3-dimensional space (length, width, and height) it occupies. This is measured in cubic unit like cm³, m³, etc. and a, b and c are three sides of the triangle. Example 1: The base of a triangular field is 880 m and its height 550 m. Find the area of the field. Also calculate the charges for supplying water to the field at the rate of Rs. 24.25 per sq. hectometer. Example 2: Find the area of a triangle whose sides are 50 m, 78 m, 112 m respectively and also find the perpendicular from the opposite angle on the side 112 m.
∴ Area = 1680 sq.m. Example 3: The length and breadth of a rectangle are in the ratio 9 : 5. If its area is 720 m², find its perimeter. Solution: Let the length and breadth of a rectangle are 9x m and 5x m respectively. Example 4: How many squares are there in a 5 inch by 5 inch square grid, if the grid is made up one inch by one inch squares? 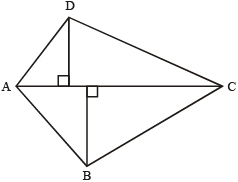 Area where a is side and d¹ and d²are diagonals. Example 5: The perimeter of a rhombus is 146 cm and one of its diagonals is 55 cm. Find the other diagonal and the area of the rhombus. Solution: Let ABCD be the rhombus in which AC = 55 cm. Example 6: Find the area of a quadrilateral piece of ground, one of whose diagonals is 60 m long and the perpendicular from the other two vertices are 38 and 22 m respectively. Example 6: A 5100 sq. cm trapezium has the perpendicular distance between the two parallel sides 60 m. If one of the parallel sides be 40m then find the length of the other parallel side. Example 7: If area of a circular jogging track is 3850 sq. metres. What is the circumference of the jogging track? Solution: Let the radius of the circular jogging track be r metre. Example 8: The radius of a wheel is 42 cm. How many revolutions will it make in going 26.4 km? Example 10: The circumference of a circular garden is 1012 m. Find the area of outsider road of 3.5 m width runs around it. Calculate the area of this road and find the cost of gravelling the road at Rs 32 per 100 sqm. A cuboid is a three dimensional box. A cube is a cuboid which has all its edges equal. A prism is a solid which can have any polygon at both its ends. It is a solid which has both its ends in the form of a circle. Example 11: A road roller of diameter 1.75 m and length 1 m has to press a ground of area 1100 sqm. How many revolutions does it make? A pyramid is a solid which can have any polygon at its base and its edges converge to single apex. Example 12: A right pyramid, 12 cm high, has a square base each side of which is 10 cm. Find the volume of the pyramid. Solution: Area of the base = 10 × 10 = 100 sq.cm. It is a solid in the form of a ball with radius r.
It is a solid half of the sphere. It is a solid which has a circle as its base and a slanting lateral surface that converges at the apex. Example 13: A frustum of a right circular cone has a diameter of base 10 cm, top of 6 cm, and a height of 5 cm; find the area of its whole surface and volume. Solution: Here r¹ = 5 cm, r² = 3 cm and h = 5 cm. Volume = = 256.67 cu. cm. When a cone cut the left over part is called the frustum of the cone. b → breadth,a →width of the pathway.